During E3, VentureBeat spoke with Kingdom Hearts creator Tetsuya Nomura about why a world based on Pirates of the Caribbean: At World's End was chosen to appear in Kingdom Hearts III alongside Hercules, Frozen, and Monsters Inc.
Pirate's of the Caribbean is a film franchise with five entries. The first film, The Curse of the Black Pearl, was originally featured in Kingdom Hearts II which makes its appearance in Kingdom Hearts III the second returning world. But how come Square Enix decided to skip over the second film in the Pirates franchise, Dead Man's Chest in favour of the third film? The confirmation of a Davy Jones battle as well as more dynamic action in this world is sure to make fans thrilled. I wonder if a Kraken boss fight is still possible. If Luxord is replacing Cutler then the Kraken could still be alive. I could definitely see a Heartless version of the fight still happening. I like that I get to keep adding more and more movies to my "Watch alongside Kingdom Hearts" list. Plus, the third movie was way better than the second, I'm glad Barbosa is back (he's my favorite character because he cares so much more about his crew and he wasn't really the villain in the first movie IMO they just wanted to be normal again, but it was even better in 4 when he used poison dart frog venom omg that was so cool) and the situations in 3 were a lot more action oriented as well. This was a rather unexpected but welcome inclusion. I don't like seeing Will and Elizabeth again though. Tbh World's End makes more sense with the narrative KH3 is trying to portray than Dead Man's Chest so I was honestly fine with their decision to skip the second movie in favor of the third. Davy Jones boss? F*** Yeah. Hopefully this means Zurg is also in. I thought they coulda just combined them and changed around the plot to work in a shorter time but yea them skipping the middle is also fine. I am curious how SDG will enter the plot, and at what point. And of course, what deviates from it. I already noticed that big jungle like area that I don't really recall from the third movie, but rather the second. Also clearly whatever Luxord and that big Heartless are doing lol. He just confirmed Davy Jones fight y'all, hell yea! I am excited to see what he looks like. From what we saw in the trailer, SDG were crossing the sea of lost souls. Which means they should come across an insane Jack in Davy Jones' locker. I definitely hope there's a Heartless Kraken boss, omfg. But the confirmation of the Davy Jones fight is very exciting. Can you guys imagine what that final fight from the movie with the ships battling in the maelstrom will look like in these graphics and actually getting to PLAY through that? I used to imagine that as a kid, thinking if Pirates ever returned in a future game we could have that boss fight happen and there could be a Reaction Command that lets you jump between the different ships in the middle of the giant whirlpool. But now RCs are mostly dead, so we could actually jump between ships OURSELVES rather than just pushing Triangle. Oh my God, I need it. Davy Jones boss? F*** Yeah. I know right, I'm so glad Nomura didn't pull a CLU on Davy Jones. Now, all we need is a boss fight for Randall and Hans. I am so happy that Nomura didn't pull a CLU on Davy Jones and we get to actually fight him as Boss. Curious to see how they would make the Boss fight work because in the film Jack and Jones were dueling on the rigging of the Flying Dutchman so not sure how Sora, Donald and Goofy will fight Jones on the Ship Rigging unless they get to fight him on the Main Deck of the Flying Dutchman itself. Also, It just came to my attention that the Japanese voice actor for Davy Jones in the Japanese dubs for Dead Man's Chest and At World's End also voiced Braig/Xigbar so mind-blowing for me. Also, I concur with why Nomura chose At World's End over Dead Man's Chest since the former fits with the narrative plot of KH3 and the latter had the film ending on a cliffhanger when the Kraken drags Jack Sparrow and the Black Pearl to Davy Jones' Locker. Looks to be the case. Imagine how SDG would react when they see the other Souls of the Dead in Davy Jones' Locker (shudders). But the confirmation of the Davy Jones fight is very exciting. Can you guys imagine what that final fight from the movie with the ships battling in the maelstrom will look like in these graphics and actually getting to PLAY through that? I used to imagine that as a kid, thinking if Pirates ever returned in a future game we could have that boss fight happen and there could be a Reaction Command that lets you jump between the different ships in the middle of the giant whirlpool. I'm just happy Nomura didn't pull a CLU on Davy Jones, as for the fight in the Maelstrom in KHIII I also had the same thoughts as you did prior to the worlds official return in III. Pirates 3 lending itself more to the plot of Kingdom Hearts, and being more action packed, was certainly something I thought of last week during the Easy Allies discussion. It's good to see the reason why Nomura chose it was because there was more to do and it'll be more of a complete world rather than ending on a cliff hanger or merging two film plots together. I am extremely worried about the game's performance in the Pirates world on base PS4. What we've seen looks like it could be really taxing, and the Maelstrom fight with Davy Jones is really going to be pushing everything to the limits. Considering that's all for a Disney world I am extremely cautious about further worlds and battles and how they will run. What I want to know is, if the Back Cover Box is apparently replacing the Dead Man's Chest in the world, then what does that mean for Davy Jones? What is his interest in the box if it's no longer his own heart that he's defending? I'm very curious on this. I think it was cool of Nomura to make such a narrative change, but I also wonder how the rest of the plot elements will be adjusted to compensate. Also, this is precisely why I got a PS4 Pro, specifically to have the smoothest possible experience with KH3 (aside from buying an Xbox One X of course). I'm sure the base PS4 will run it decently, but I don't want to be worried about frame drops and other things breaking the immersion. Playing 0.2 on the Pro proved that it was worth it as well, as the game runs so much more smoothly and looks crisper as well. Not to mention Shadow of the Colossus in 60fps? That alone was also worth it to upgrade to the Pro. Highly recommend. I dunno, Stinky Pete could also be the Toy Story antagonist for Toy Box. He could have found a way to escape from his owner because they're in the alternate dimension. I just hope KH3 doesn't make my pro really loud. There was a massive jungle on the island where they go and realize the Kraken was killed. It's the scene where Barbossa tells Jack they have to go to Shipwreck Cove. Oh, no! It just dawned on me. By skipping the second movie we're skipping the jar of dirt scenes. Cancel KH3, I don't even want it anymore. Ah, my ultimate KH3 dream to see them use Pirates 2 & 3. With no second visits it makes sense to use At World's End. It's personally my favorite Pirate film anyways. I never had any doubt we'd be getting Davy Jones even though he wasn't in trailer. I'm just interested in how many cuts there's gonna be to the story cuz there's no way they can cover all of At World's End. Actually, probably not. In an interview posted on the official Toy Story 2 website after the release of the film, he said that he's come to actually like being drawn on and is happy with his new life. The reason he was a bad guy in the film was a combination of envy over never being sold to be played with by a child, and a desperation for some kind of fulfillment by being a part of a museum collection. Now he has what he originally wanted. huh? i never knew about that. I think I now understand why 100 Acre Wood is returning. Sorta find it interesting though that he didn't consider The Witch Lion & The Wardrobe. Since it's a very diverse and unique live action feature, that could fit perfect with KH3. ImVentus; I think I know why it wasn't considered. The Lion, The Witch and The Wardrobe is like The Black Caldron; it has a double license since it was based on a book, and they'd have to get permission from not only Disney, but whoever holds the rights to the book too. At least we still have at least 2-3 more new worlds aside from that mini game world still left to be revealed. I hope to hell the game's optimized, but I have a gut feeling it won't. I love all the Pirates of the Caribbean movies, but At World's End is by far my favorite one. As such, I am super excited to experience it as a world in Kingdom Hearts III. Reading Nomura's reasoning behind skipping to the third movie makes sense too. 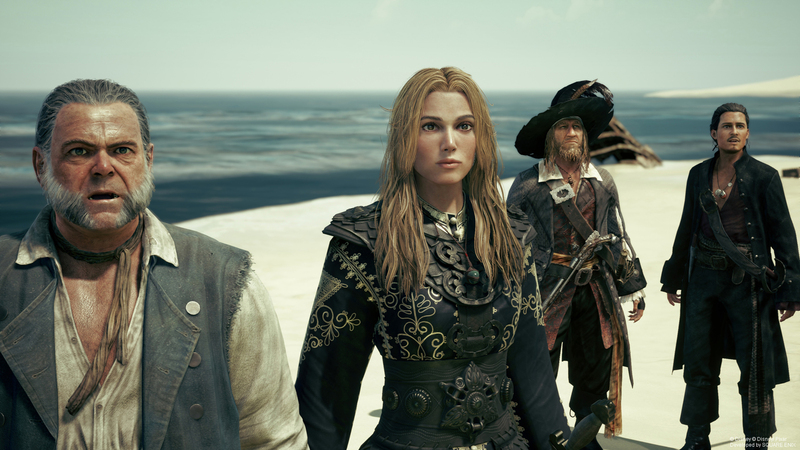 After all, Dead Man's Chest ended with some huge (but good) cliffhangers, and since Kingdom Hearts 3 is supposedly the end of this saga, At World's End will deliver a more complete end to the Pirates of the Caribbean storyline in Kingdom Hearts. Good choice on Nomura's end; it's worth noting that At World's End also uses rebirth as a trope, so it's likely Sora will understand a little more what it means to be a savior by coming to save Jack. First, though, someone has to break the news to Sora (both Jack and â€‹Barbossa). Add your account to his PS4 and use the cloud save function. You'll be able to access your save on both consoles. Davy Jones Boss battle FTW!!!! I rewatched Dead Manâ€™s Chest and actually quite enjoyed it. Itâ€™s kinda meandering and yeah, itâ€™s set up, but I like the characters and I like spending time with them. But yes I hope we also get Beckett. A Kraken battle wouldâ€™ve been great. If they had followed the KH2 formula, visit 1 couldâ€™ve been Dead Manâ€™s Chest, visit 2 couldâ€™ve been AWE. Albeit supreeeemely short versions. I wonder if this will be our last romp in Port Royal. POTC is still popular but it kind of lost momentum with the fourth movie and onward, I wonder if the other films will be used in future games because of that. Depends if he would appear in the game. There is also a possibility according to people discussing this that Luxord might fill in the role for Beckett for the Caribbean world in III, so I wouldn't be surprised if he would be written out. The Kraken will go either way because, in At World's End, Beckett ordered Davy Jones to kill the Kraken to which he reluctantly did, if Luxord takes Beckett's place in the game then the Kraken would still be alive but it might turn into a Heartless version of itself by Luxord. It will depend how the world will be implemented in future games, because in the post-credit scene of At World's End it flashes forward to a decade later with Elizabeth and Will having a son named Henry Turner (who is one of the supporting protagonists of the 5th movie, Dead Men Tell No Tales) and the timelines for the 4th and 5th films take place during the 1750's two decades after the events of the 3rd movie. Maybe, but the aesthetic of Galaxy Toys seems very Zurg. And Zurg would be more of a threat in battle versus an old man like Stinky Pete (however conniving he might be). On another note, I'm hoping for a giant Tia Dalma/Calypso fight. The inclusion of all of the Titans in Olympus (and hopefully a fight with the Cyclopes in Thebes) has me thinking that KHIII is not going to shy away from the big budget battles. The inclusion of all of the Titans in Olympus (and hopefully a fight with the Cyclopes in Thebes) has me thinking that KHIII is not going to shy away from the big budget battles. The Rock Troll Heartless in the images and the trailers released last year looks to be replacing the Cyclopes that attacks Thebes from the film. I think I saw a screenshot of it recently with an insanely small HP bar, so I kinda think its just a big, normal enemy tbh. It could just be some Heartless attack in general? I think its a possibility, but really its up to the team if they liked the movies or think they fit well and not really about audience opinion on the last 2 films. If it is the last time, its a great way to go. I am wishing other worlds whose stories have sorta been "used up" had been saved for this jump in graphical style and world design...so its getting a better treatment than some of the more popular renaissance movies and just in two usages lol. Nomura called it a mid-level boss for Olympus. Don't be put off by the small HP bar. We know that the Rock Titan has to be defeated by breaking both legs, and then smashing the head. The HP bar in images might be for the shield which needs to be destroyed before you can harm the body. Did any attack from Sora actually damage the Rock Troll? Other enemies in the trailer were getting injured, but I can't recall if the Rock Troll was getting injured, either through the shield or regularly. Might need some special attack to actually inflict damage. I'm really glad we're getting a Davy Jones boss battle. Always found him a really cool villain. A (Heartless) Kraken boss fight would be great as well. I'm glad Davy Jones will still have a boss battle. Hopefully the Kraken will, too. I get their reasoning for skipping to At World's End, but it's easily the worst PotC movie, imo. But it looks very video game friendly in terms of setting and characters. On Stranger Tides would make for a horrible world visit. Lame villains, lame locations, lame story. Easily the worst POTC movie. Dead Men Tell No Tales has some solid locations and villains so it would make for another solid return to the Caribbean. (Salazar, sharks, the town from the opening, the devil's triangle) Keep in mind POTC 4 & 5 take place like 20 years after At World's End so a major time skip would be in order depending on what the next KH saga actually is. Oh did he? Then yea maybe it has multiple targetable spots or a gimmick. I don't think we have seen it get hurt, only it hurting Sora lol. "News"? You mean Barbossa not being evil anymore? I wouldn't be mad if this were the last time we see PoTC in the series, considering how lame the movies became after the first three. There's a wealth of live action films to pull from in the future that I think would be exciting - A Wrinkle in Time, Holes, Haunted Mansion, Oz the Great and Powerful, Narnia, The Muppets, National Treasure, Alice in Wonderland - to name a few. I'm sure there's some copy right stuff to work out with some of them but it's not like they haven't done so before. Which is exactly wha I said earlier, in the post-credit scene of At World's End it flashes forward to a decade later with Elizabeth and Will having a son named Henry Turner (who is one of the supporting protagonists of the 5th movie, Dead Men Tell No Tales) and the timelines for the 4th and 5th films take place during the 1750's two decades after the events of the 3rd movie. I'm not expecting Holes, Narnia, James and the Giant Peach, BFG, John Carter, and Wrinkle in Time in any future games due to the fact they are film adaptations based on books and that requires having Nomura and his team to ask permission not just from Disney but also the authors of the book and the estate (the family/relatives of the authors (e.g. Roald Dahl, C.S. Lewis, Madeleine L'Engle)) which I don't think they will be pleased nor will they allow SDG in the worlds based on the film adaptations inspired on the author's work, most particularly the Dahl family. The former looks to be unlikely given that there isn't any fantasy elements in the film, despite having some supernatural dangers (e.g. Yellow-Spotted Lizards) [SIZE=2]and while both John Carter and Wrinkle do have fantastic visuals and environments from the films that will make fantastic KH levels, none of these films did well at the Box Office which makes there chances of appearing unlikely. [/SIZE]I'm Not sure on how The Muppets, and National Treasure will work with Kingdom Hearts, especially the latter as it doesn't have the fantasy sci-fi elements that Pirates and Tron had. I think the most likely live-action films that could be worlds I could see appearing in a future game or III (depending if Nomura might add one besides Pirates) are Oz: the Great and Powerful, the 2010 Alice in Wonderland film, and Black Hole, of course, I see the 2010 Alice in Wonderland film unlikely given that it would contradict the animated version of Alice in Wonderland and the world itself, but giving Nomura saying it's his favorite film, you may never know. Also the upcoming Nutcracker and the Four Realms movie coming out this November would be a nice new live-action world level for a future Kingdom Hearts game. I see The Muppets being the new Hundred Acre Woods. No real danger or monsters. This world would be comfy and the characters just do silly mini games together. Because just like Pooh I can't see Kermit getting involved with fighting shadow monsters or apocalypse cults. The good thing is that with the positive change in level design starting with 3D and continuing into KH3, I can mostly ignore the characters/plot of a world I donâ€™t understand and enjoy the environment and enemies anyway. I learned that from The Grid. I had no idea about anything that was going on except that Rinzler was supposed to be TRON (or something???) and was bored out of my mind, but the world itself was still pretty fun to play around in. Oh, I would LOVE this. If PIXAR's going to be in KH, then we might as well let in The Muppets, too. That said, I'd like other Disney films that would be difficult to translate into battle-ready worlds (like Dumbo, Bambi, Lady and the Tramp, etc.) at least be used as minigame worlds at some point in time. I would love that. Partly because I'm kind of over 100 Acre Woods and because the Muppets are an amazing, iconic property. I'm replaying DDD right now and I feel this. I'd never seen the original Tron before but the world in KHII was a success for me because of how well they implemented it into the main plot. But whewww was The Grid a slog to get through plot-wise in DDD. I had no idea what was going on and could not bring myself to care. To bring things back to PotC, I'm glad that it looks like the scenario writers are putting more effort into combining the KHIII story with the story of the film. Port Royal kind of flopped for me in KHII because it was a boring retread of the first movie but with a bad Johnny Depp impersonator. But how can The Muppets be integrated naturally? all of the Live Action properties were compatible in Kingdom Hearts because they were based in their own encapsulated fantasy. The Puppets is as opposite of Kingdom Hearts as you can get, the characters themselves are a suspension of disbelief. I'm all for The Muppets, it's just a question about the properties integration. I had no idea about anything that was going on except that Rinzler was supposed to be TRON (or something???) and was bored out of my mind, but the world itself was still pretty fun to play around in. To be fair, that was pretty much my experience with watching TRON Legacy, speaking as someone who liked the original TRON. But I agree with your main point; it's a lot better if worlds are fun even for people who aren't familiar with the original film and KH hasn't always hit that mark. I haven't seen Alice in Wonderland, for example, and the various games have varied quite a bit in how much I liked their Wonderland worlds.